Shiki Bus Grape Picking & Onsen Tour (四季の旅・ぶどう狩りと絶景温泉) is one of the very popular fruits picking tour of Shiki. You can enjoy fresh seasobale grape and eat as many as you want. Then you are going to enjoy Onsen and Harb Garden. It is very reasonable tour. 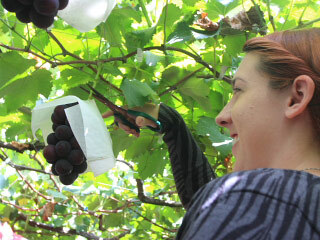 Grape picking is a great for kids to adults. All you can eat at the grape fram. This tour offers you the fresh grape picking and Onsen with a great view of Yamanashi Prefecture. Yamanashi is the one of the very famous grape producer in Japan. It will be great for family activities with your kids. Then, you will visit beautiful Harb gardens. You can eat as many as you want in the farm. There are some manners that you have to follow. You can only eat in the farm. You have 30 min. of picking and eating. If you can't finish eating your grape in the time, you have to buy it as your souvenior to bring them back home. Pick up your grape one by one. Don't pick up the piece from the grape. You have to pick up whole grape. Trash them into the backet. The kinds of the grape you pick will be depend on the season. The fee of Onsen is not included. This place is also have a restaurant and gift shop. It has a great correction of various kinds of Harbs and their products. Ice cream is especially popular here. What's special about this tour. 1. Only 40 people limited from 6,480 JPY as very reasonable price. 2. Safe and confortable with the special guide all the time. 3. You can join from single person. The seat will be located next to the same gender. 5. Visiting Onsen with view. Hottarakashi Onsen or Mitama Onsen. Onsen and launch are not included. Onsen is 800yen. Soap, Shampoo dryer are available. 6. Visiting Harb Garden. The guide will be tour inside of the harb garden. 7. Visit Sato no Eki for shopping local products of Yamanashi. 07:30 start sign up at the parking. 07:45 the bus leave Shinjuku. 17:30 back to Shinjuku Station.